These can impact generally on hair quality or cause excessive shedding as Hair cells are the one of the most sensitive cells in the body to internal fluctuations. It is a myth that only men suffer from genetic thinning, most women who suffer from androgenic Alopecia have diffuse thinning which can affect the entire scalp, but some do suffer from the ‘Ludwig’ pattern noted by significant hair loss through the top of the scalp compared to the back and sides. Androgenic Alopecia in women can be a natural phenomenon caused by the onset of the menopause, but it also can be exacerbated by hormonal imbalances, medication or underlying medical issues that are having an impact on shortening the hair cycle independently of hormones. We try to ensure there is no underlying issues that can be impacting on the hair cycle, after which certain medication can be used to maintain and strengthen the hair. Telogen Effluvium (excessive diffuse hair shedding) may be caused by a number of problems. Acute (Quick onset) diffuse hair loss can be caused by a shock, be it psychological, physical or emotional (e.g. : Pregnancy, medication, a physical or emotional shock to the system, an illness or a fever). Chronic (Ongoing) diffuse hair loss is caused by an underlying problem which is causing the hair cycle to be interrupted and shorten. This could be something as simple as a nutritional insufficiency, long term medication or even simply be age related. Many of the ‘triggers’ for chronic hair loss issues we deal with may have happened many years ago, are low level, innocuous and have gone under the ‘radar’ of most doctors for a long time. Sufferers from both types notice a thinning of hair on the scalp, and little ‘broken’ hairs around the fringe and poking out around the parting, Chronic Telogen effluvium is a problem which usually carries on indefinitely until the problem is rectified. 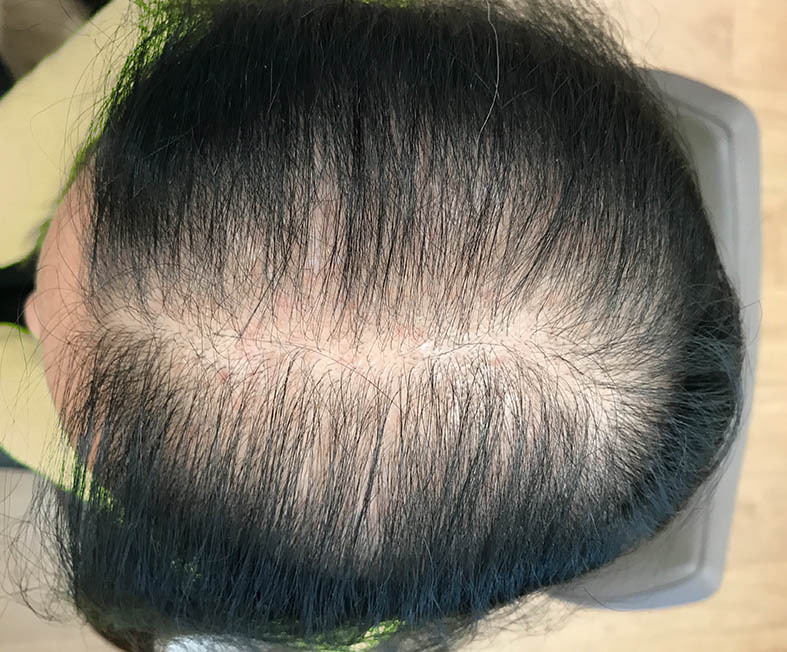 This problem is largely female problem and is ‘self-limiting’ this type of hair loss does not cause total baldness but can make the hair feel and look extremely thin compared to what it did. Female genetic thinning can be purely ‘genetic’ or can be exacerbated by underlying health problems or long term medication, causing the problem to become worse. We will investigate your medical history to eliminate any exacerbatory issues and advise you on the best medication which can maintain your hair density long term. 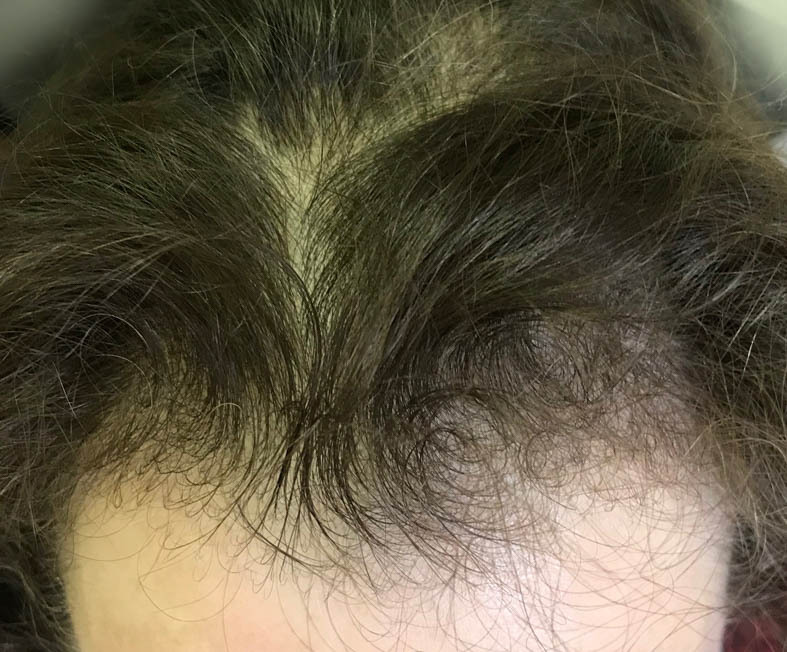 Acute Telogen effluvium, the disorder will simply rectify itself after 6 months or so, the shedding will slow and the hair will gradually get back to normal, we can help diagnose the trigger and offer advice as to when you will see a change in the hair cycle. what the treatment will be.